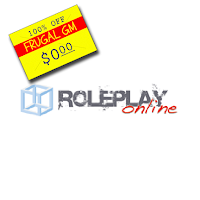 This week's Free GM Resource is one I used to use a lot, but haven't in a couple of years: Roleplay Online. Roleplay Online (rpol.net) is a great online space for people to run online play-by-post RPGs. It has all the functionality of traditional forums, along with probably the best die roller I've ever seen....as far as options go. RPOL isn't the prettiest site I've seen, but it is extremely functional. If you want to find and play in a play-by-post game this is the place to go.